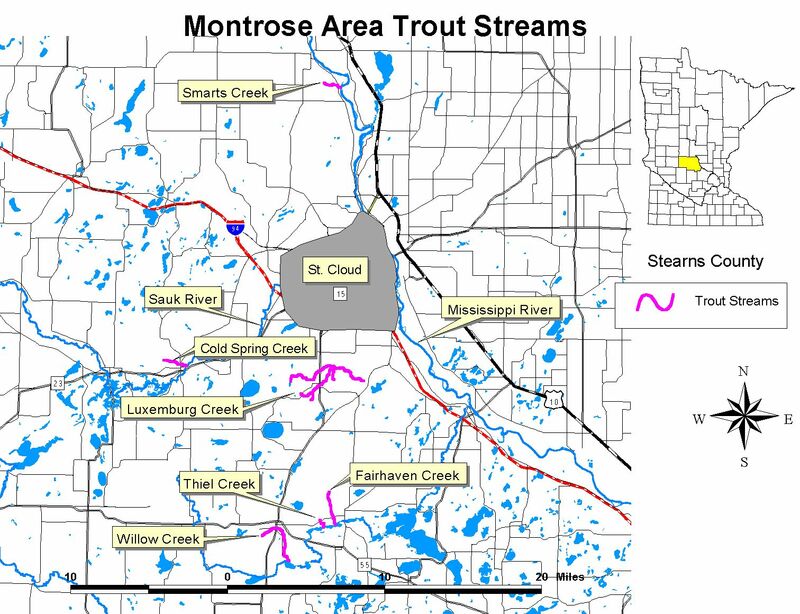 Within the Sauk Rapids Area there are several trout streams, most of which are located in eastern Stearns County. 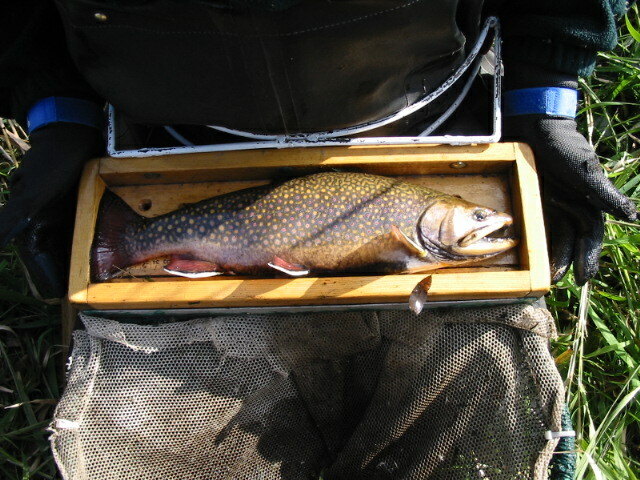 Although access is somewhat limited, there are some opportunities to catch trout. 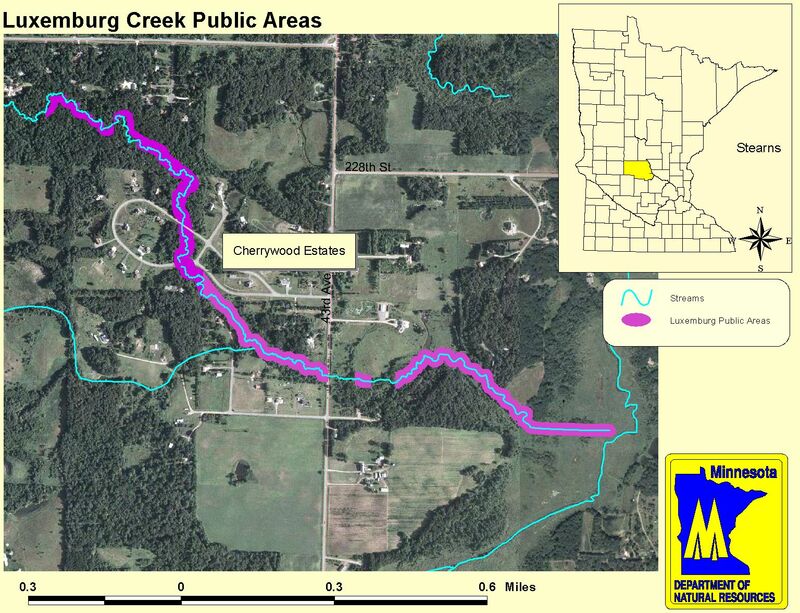 Easements and public property are located along sections of Luxemburg Creek, Willow Creek, Cold Spring Creek, and Smarts Creek. We have annually stocked catchable (yearling) brown trout in Willow Creek near Kimball, in an effort to provide some recreation opportunity. In 2006 we tried a new approach by using fingerling brown trout (6,000) in an attempt to establish a reproducing population. We will be evaluating our approach over a two year period using fall electrofishing. When trout fishing on area streams, please ask permission to fish on private land. We have included reports on recently sampled streams. We also have included links to images of publicly accessible areas on four area streams. Several of the reports refer to potential habitat improvement work to increase deeper pools with cover and offer natural erosion control methods. We have had the opportunity to implement several root-wad revetment habitat structures and initiate buffer strip use in three of our area trout streams. With the cooperation of Mid-Minnesota Trout Unlimited, The City of Cold Spring, ROCORI Middle School and the City of Kimball, as well as several land owners, we were able to complete habitat improvement projects on Luxemburg Creek, Cold Spring Creek and Willow Creek. We will be evaluating the changes that take place in these streams over time through habitat measurements and electrofishing. One of the biggest challenges these streams face is the increase in impervious land (areas that water does not filter through) within their respective watersheds (the area that feed the streams, rivers and lakes with water). Increasing amounts of pavement, concrete and even green lawn have drastically influenced the way the streams function. The change in land surface, with compacted soils has made runoff a major issue for many streams in Minnesota. This is particularly true in areas of accelerated housing and commercial development. Developers are encouraged to incorporate no-net run-off in their site designs. Buffer strips (areas left unmowed near the stream and or tributaries), easements, and best management practices are important along all the stream frontage throughout the watershed. How do we know that development has damaged our streams? Through continual monitoring, and analysis of trout populations, water temperature and water flow data, we have found that streams are becoming more subject to flashy flows that increase sediments, increase temperatures and destroy valuable habitat. We all live in a watershed and can all make a difference. Eroding bend prior to root wads and sloping of bank. 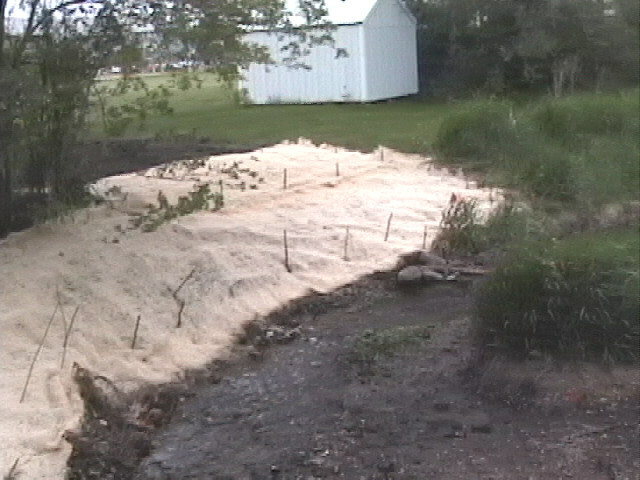 After installation of root wads, sloping the bank, reseeding with native plants, staking with willow and dogwood and covering with mulch fabric.